Floor to Ceiling Books: Spec Fic Reading Challenge: May Review Link Up! Welcome to everyone who signed up for the Speculative Fiction Reading Challenge! 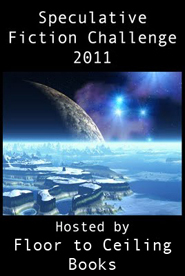 This is post where you can link up your reviews posted on your blogs in May 2011 to be in with a chance of winning the prize pack. The prize pack this month consists of: The Ritual by Adam Nevill. All of the reviews you post to Mr Linky below will equate to an entry into the prize draw. Good luck to you all, and I look forward to seeing your reviews for May! My first review of the month :-) It's Hunger by Michael Grant, second book in the Gone series. I really liked it! An actual SF review, not fantasy :-) Those are rare on my blog ;-) It's Mike Shepherd's Redoubtable, a Kris Longknife novel. A Canticle for Leibowitz, by Walter M. Miller Jr. I know it's a classic - I just never got around to it until now. Tough read though. Managed to review 'The Stars my Destination' good book, especially considering it's probably one of the older sci-fi books I've read. My first challenge-related post for May! Resurrection Code by Lyda Morehouse. Also, I've just finished my 12th book for the challange. Hooray! Another post for May -- Hounded by Kevin Hearne. Loved this book. Quite enjoyable. Review of Tom Kolega's military SF novel, Shadows of the Past, linked! If I counted all the books I read and reviewed separately, I'd be at 12, but since I'm grouping some series together . . . I'm at 8. Ah well. Reviewed the entire Mistborn trilogy by Brandon Sanderson. Fianlly got around to reading The Blade Itself by Joe Abercrombie, which brings me up to 11. It was so good! Right I hope that went okay and that I didn't accidentally post the Dracula link twice, but here are two more for this month :D Moira J Moore's latest and the classic Dracula! Another SF one, Peter F. Hamilton's Misspent Youth. Linked to my Unholy Magic review at Boomtron.com. Thats 12 for me now. I managed that a lot faster than I had expected!